“We have now arrived home and our week in your beautiful cottage is a happy memory. The weather wasn’t kind to us but it really didn’t matter too much. The location, the cottage and all the scenery couldn’t be spoiled by drizzly weather, all were stunning. You have a very comfortable and beautifully appointed cottage there. It was amazing to sit at the window and see the sea and the seals coming and going. As you warned the binoculars were a real temptation to just see what was going on. We were very impressed with the size of the bed and how comfortable it was, I was reluctant to move when the weather outside was a little gloomy! As we drove to the ferry on Saturday morning at 6 o’clock we found deer waiting for us on the side of the road. A wonderful parting memory. It was only in the queue at Lochmaddy we realised that we had been so busy looking that neither of us had taken any photos! Ah well, you can’t take the memories away and I think we finally stopped waving to other drivers on the M8 around Glasgow! “We just wanted to drop you a note to say that we had an absolutely lovely stay at the cottage and on Berneray. The cottage is so lovely and cosy and we had the absolute luck of having two or three days of bright sunshine, so much that we got sunburnt on our walk along the West beach. “If you are looking for a base to explore the Outer Hebrides, Backhill Cottage should be on anyone’s shortlist and it is only a short walk from the Berneray ferry and a 20 minute drive from the ferry terminal in Lochmaddy. First impressions surpassed all our expectations – especially the location – only metres from the sea, which is perfect for bird, seal and otter spotting, and there was something very restful about tuning into the rise and fall of the tides. The cottage is really well laid out for 2 people and incredibly cosy and tastefully decorated – the stove that was set for our arrival didn’t have to be lit in the week we spent there. The massive bed with a sea view was special as was the power shower that set us up for each day. We arrived to find chilled prosecco and nibbles in the fridge – a gesture much appreciated. The bookshelves are full of guides, maps and literature which complement the island experience. The beaches on Berneray and the neighbouring islands are up there with the best in the world and we spent a lot of time exploring the dunes, surf and rockpools – the closest only a short walk from the cottage. “This was our third visit to Berneray, and to this beautiful cottage. Only a short drive from the ferry at Lochmaddy the property is set in a lovely location, very close to a rocky shore and you can watch the seals from the living room window! The owners were extremely helpful and responsive during the booking process, very pleasant to deal with, and keen to ensure that we enjoyed our holiday. The cottage is furnished to a very high standard, is in excellent condition and was spotlessly clean. There are lots of Harris tweed accessories (rugs, curtains, cushions) and lovely Denby crockery. I’m a keen cook, and the kitchen had everything I needed. The bedroom is beautiful – lovely crisp white bed linen and a very comfortable bed. For colder days there is a lovely log burning stove, two very comfy sofas and a fantastic selection of books. The cottage is very well situated for exploring Berneray’s beaches – East Beach can be reached on foot and West Beach is a short drive away. West Beach is especially lovely. On North Uist there are further beaches – we especially liked Clachan Sands. There is a great array of wildlife – great for birdwatchers and those, like me, who love wildflowers. We had great weather and spent at least half of our days on the beaches – and even came away with a tan! Berneray has a little local museum located just along the road from the cottage, a small (but perfect) craft shop (The Coral Box) situated at the harbour and a well-stocked grocery (Ardmaree Stores) – with a cafe attached. In Lochmaddy the arts centre – Taigh Chearsabhagh – is excellent. We saw two great exhibitions there, and also looked at some of the archive material. It has a nice little shop and cafe too. “This was an excellent cottage to explore Berneray and North Uist. We were extremely comfortable in the cottage and enjoyed long evenings in the warmth of the stove which meant it was warm and cosy when we woke. The cottage was spotless and is well maintained and we did not want for anything. We did not have a need to contact the housekeeper as all was good. We spent many an hour watching the seals or bird spotting from the window with the field binoculars. The maps and abundance of books were excellent and helpful. We were pleased to have a bike cover for our bikes. We loved walking the West Beach loop where we spotted the otter and the Udal Peninsula where we saw a Gyr Falcon and Golden Eagles were seen on a number of our outings. All information from owners was helpful and very prompt and we felt welcome in their second home. The Ardmaree Stores was well stocked and friendly and for local seafaring Hebridean wool we would recommend The Birlinn Yarn Company. “We had a wonderful holiday in Berneray not least because of this truly extraordinary cottage. The house sits right by the sea, so much so, that gazing out of the windows from the living room sofa, you could easily imagine you were on a boat. We have never visited somewhere that so instantly felt like home, although our home doesn’t have seals swimming outside the window and Oyster Catchers swooping over the garden. “The cottage is old style outside but very comfortable and warm inside. Everything was tops; from the extremely comfortable mega kingsize bed to constant hot water whenever it was needed. It is in a great situation for easy access and parking. And superb for seal watching and bird watching. We spotted a Great Northern Diver from the lounge window and plenty of red shank flitting about among the rocks….I just caught sight of an otter slipping into the water one morning; from the lounge window again. There are plenty of walks not far away, over the flowering machair with interesting historical sites en route. And of course, the 3 mile west beach is iconic. 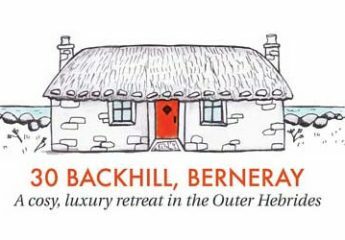 We thoroughly enjoyed our stay and would recommend this delightful little gem on Berneray. “This is a peach of a property, in an amazing location right next to the sea in a sheltered bay. It’s lovely to look out on the seals basking nearby on the rocks at low tide.